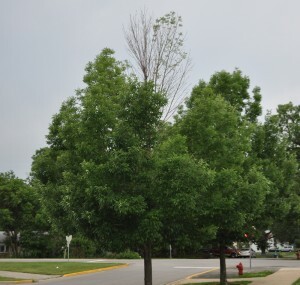 The Emerald Ash Borer can be difficult to spot. If you notice any of the following signs and symptoms of infestation contact us immediately to begin Emerald Ash Borer treatment. Dieback of the upper and outer canopy begins after multiple years of EAB larval feeding. Trees start to show dead branches throughout the canopy, beginning at the top. Larval feeding disrupts nutrient and water flow to the upper canopy, resulting in leaf loss. 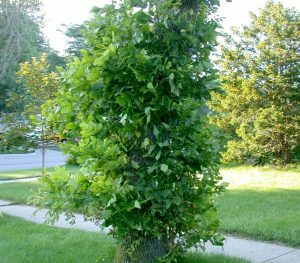 Leaves at the top of the tree may be thin and discolored. When trees are stressed or sick, they will try to grow new branches and leaves wherever they still can. Trees may have new growth at the base of the tree and on the trunk, often just below where the larvae are feeding. The leaves may also appear larger than normal. 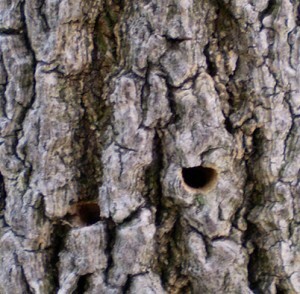 Several woodpecker species will feed on Emerald Ash Borer larvae/pupae. Woodpeckers will peck on the outer bark while foraging creating large holes and potentially removing strips of bark when extracting insects. 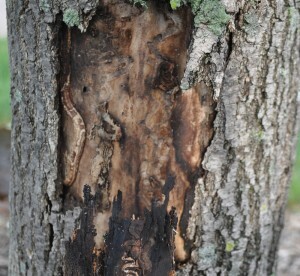 Vertical splits in the bark are caused due to the callus tissue that develops around larval galleries. Larval galleries can often be seen beneath bark splits. As larvae feed under the bark they wind back and forth they form serpentine-shaped galleries, which weave back and forth across the wood grain. These galleries are packed with frass (a mix of sawdust and excrement). 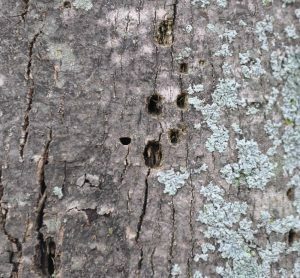 Adults then emerge forming D-shaped holes, which are typically 1/8” in diameter. Unfortunately by the time the D-shaped holes are noticed near ground level, the tree will likely be in severe decline. 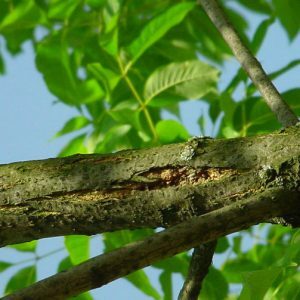 It is important to notice early signs such as minor canopy dieback and woodpecker activity as soon as possible and begin preventative treatment immediately.